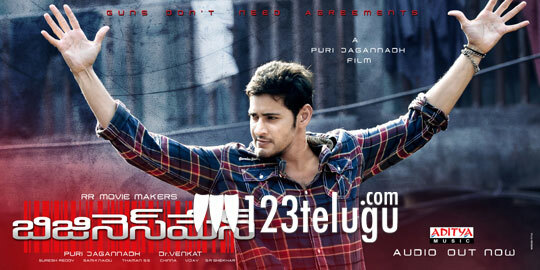 Mahesh-Puri Jagannadh’s Business man celebrated its audio release yesterday evening at Shilpa Kala Vedika, Hyderabad. Tollywood biggies Super star Krishna, Vijaya Nirmala, Dr. D.Ramanaidu, SS Rajamouli, Srinu Vytla along with Mahesh Babu, Namrata Mahesh, Puri Jagannadh, Kajal and Charmi graced the audio launch. This star-studded trilingual audio release function with zingy performances from Mumaith Khan, Swetha Bharadwaj and Swetha Basu Prasad etc. was a huge success. The audio was released in Tamil, Malayalam and Telugu. Much awaited video of making of Business man theme song for which Mahesh rendered his voice as singer along with Puri Jagannadh was released in the event. This 3 minute video has visuals of Business man on sets and in recording studio followed by few intense dialogs from the film uttered by Mahesh at the end. The response for this theme song has been terrific. Video trailers of the remaining songs have also been released. This album is a package of exhilarating numbers which can top the chart. Hari Venkateswara pictures congratulate Superstar Mahesh Babu, Puri Jagannadh, SS Thaman and Producer RR Venkat for the super success of “Business man” audio.